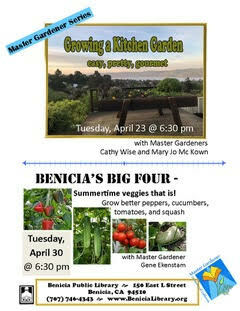 The Master Gardener Volunteer program is a great place for sourcing and learning about plants. El Rancho Nursery (Vacaville) – The largest family-owned and operated nursery in Solano County growing a wide array of plants available for delivery. Mid City Nursery (American Canyon) – A great source for gardening and plant information in Napa County and Solano County. Morningsun Herb Farm (Vacaville) – Offering a wide variety of Herb and Perennial Plants for sale online AND at the nursery. Lemuria Nursery (Dixon) – The largest wholesale grower of plants in Solano County, open to the public. Nursery owners and operators since 1939. Sweet Pea’s Nursery and Pet Boutique (Vacaville) – Organic succulent nursery with flowers, herbs, vegetables and seeds. Also a pet boutique carrying pet foods, bathing products & supplies.